The patio at the Three Sisters Vineyard. Pouring wine at Montaluce Winery & Estates. 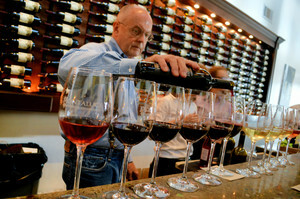 No need to hop on a plane to California, France or Italy to savor award-winning wines – Dahlonega is home to Georgia’s own highly acclaimed wine country. Visitors can enjoy a weekend of tastings for one low price at the Dahlonega Wine Trail Weekend passport event, which includes a new winery this year: Kaya Vineyard and Winery. For $35, oenophiles and vino novices can enjoy weekend long festivities and music at all six of Dahlonega’s vineyards. 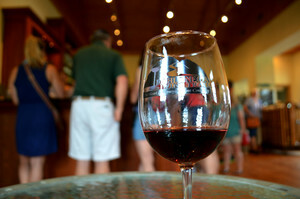 Dahlonega’s annual Wine Trail Weekend is Saturday, August 20 and Sunday, August 21 from 12:30 p.m. until 5:00 p.m. The newest addition, Kaya Vineyard and Winery, is the rebirth of Blackstock Vineyard and Winery, one of the first and largest vineyards in the Dahlonega area, which was the catalyst to a now vibrant wine region. With the highest concentration of wineries, vineyards and tasting rooms in the state, Dahlonega is known as the Heart of Georgia Wine Country and the Wine Tasting Room Capital of Georgia. Dahlonega has also applied to be officially recognized as an American Viticultural Area (AVA) called the Dahlonega Plateau. An AVA will make Dahlonega a Federally-designated wine grape-growing region in the United States distinguishable by geographic features.Presented by the Dahlonega-Lumpkin County Chamber of Commerce & Visitors Center and the wineries, visitors can taste the esteemed wines made possible by the unique North Georgia terroir and receive a keepsake souvenir glass. A wide range of European and American varietals and blends are offered at each tasting room, each with its own distinctive personality, from country farmhouse to Tuscan villa. The tastings, combined with amazing mountain views and rows of colorful fruit-filled vines, give guests a complete sensory experience during peak pre-harvest season. Wine Trail patrons begin the event at the Dahlonega-Lumpkin County Visitors Center in downtown Dahlonega (13 South Park Street)where maps, visitor guides and other helpful information are available, or ordered online at www.Dahlonega.org. Overnight accommodations and transportation options are available to make Wine Trail Weekend a getaway destination. With a charming and walkable downtown, first-rate restaurants and unique shops, Dahlonega has been chosen as a 2016 Great American Main Street Award® (GAMSA) winner by The National Main Street Center, Inc. To view all there is to see and enjoy, visit www.Dahlonega.org. For more information, please contact the Dahlonega-Lumpkin County Chamber of Commerce and Visitors Center at (706) 864-3513, or visit www.Dahlonega.org. An hour north of Atlanta, the historic town of Dahlonega (pronounced Duh-lon-a-ga), Georgia, is the site of the first major U.S. Gold Rush in 1828. Today, Dahlonega is an award-winning, authentic Appalachian Mountain community. The town has been chosen as a 2016 Great American Main Street Award® (GAMSA) winner by The National Main Street Center, Inc. The City of Dahlonega and the Dahlonega Main Street program were recognized at the 2016 Main Street Now Conference held in Milwaukee, Wisconsin. Many of the restored wood and brick structures in the Historic District are on the National Register, and offer an abundance of dining, live music, and theater. Many of the downtown restaurants have wide porches perfect for taking in the scenery. Boutiques, galleries and shops attract some of the region’s top artists and are filled with art, antiques, unique jewelry, clothing and collectibles. Dahlonega has evolved into a center for the performing and visual arts and hosts more than 10 annual artistic and cultural festivals, and is “the Heart of Georgia Wine Country” with six award-winning wineries and seven downtown tasting rooms. For more information, please visit www.Dahlonega.org, the Website of the Dahlonega-Lumpkin County Chamber of Commerce & Visitors Center. Content courtesy of the Dahlonega Press Release.